Name legal documents of constitutional importance, which have affected modern legal systems. At the heart of the English system are two principles of government — limited government and representative government. The idea that government was not all-powerful first appeared in the Magna Carta*, or Great Charter, that King John1** signed in 1215 under the threat of civil war. Earlier kings of England had issued charters, making promises to their barons. But these were granted by, not exacted from the king and were very generally phrased. Later the tension between the Kings and the nobility increased. Since 1199 John's barons had to be promised their rights. It is, therefore, not surprising that Stephen Langton, archbishop of Canterbury, directed baronial unrest into a demand for a solemn grant of liberties by the king. The document known as the Articles of the Barons was at last agreed upon and became the text from which the final version of the charter was drafted and sealed by John on June 15, 1215. 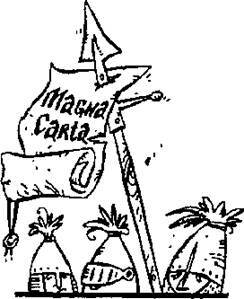 Although the Magna Carta was originally intended to protect aristocracy and not the ordinary citizens, it came in time to be regarded as a cornerstone of British liberties. It is one of the oldest written constitutional papers.